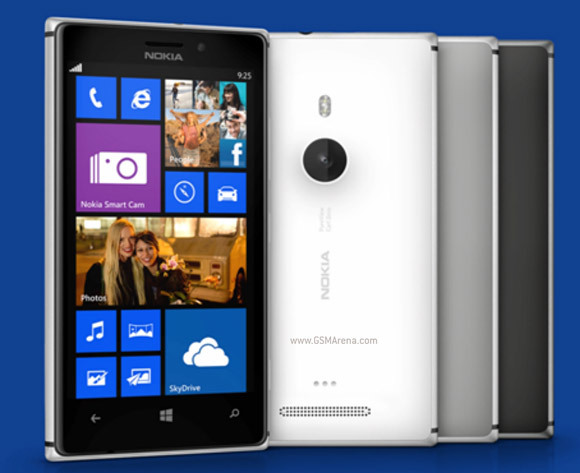 Nokia just announced the Lumia 925, its new Windows Phone 8 flagship smartphone. It packs an 8.7-MP sensor with Optical Image Stabilization, f/2.0 aperture, and an LED flash for low light conditions. The Lumia 925 also packs two IHF microphones that record distortion-free sound for the 1080p videos even in loud environments. Nokia has several smart features and tricks like the Smart Camera, which features several modes including Burst Mode, Best Shot, Action Shot, and Motion focus. The Lumia 925 has a 4.5" WXGA resolution screen of AMOLED variety with ClearBlack and Gorilla Glass 2. The Qualcomm chipset of the Lumia 925 packs a dual-core Krait processor at 1.5GHz with 1GB RAM. The phone has an aluminum frame around the side, while the back is polycarbonate. The body is just 8.8 mm thick and weighs 139 grams. Inside it is a non-removable 2,000 mAh battery. The built-in storage is 16GB and there's no microSD card slot to expand it. The Nokia Lumia 925 will be available in Europe and China this June for €470 ($610) and will come to the US later on T-Mobile. Is this the phone featured on "Live It Up" music video of Jennifer Lopez? I haven't seen the video yet but it's possible this is the phone used there...coz I've read somewhere today about a Nokia Lumia being featured on her new video. I've read an article. It's not the Nokia Lumia 925 featured on the video, but its predecessor, the Lumia 920.